If you haven't thought about it already, it's time to start making your gift-giving lists and shopping for the upcoming holiday. From now until December 25th, I hope to share with you my favorite gifts this season. 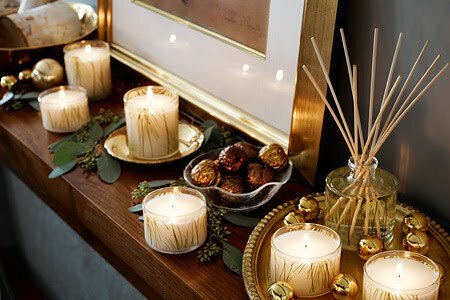 At the top of my list, are bath & body and home fragrance products from Thymes, which I've had the pleasure of trying out, in an assortment of refreshing scents. The newest fragrance is Moonflower, with a rich combination of cinnamon, clove, sugared quince, myrtle leaves, mahogany, amber and cognac. 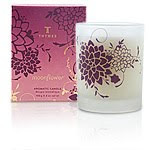 I love the packaging and moonflower design on the candle ($25 retail). The candle would be a great gift paired with the home fragrance mist ($16 retail). If your feeling festive or want to get someone into the holiday cheer, I highly recommend the Frasier Fir collection. At first I had planned on giving the Frasier Fir aromatic candle set as a gift, but now I am tempted to keep it for myself. I left the set sitting in my living room and the aroma of a fresh cut Christmas tree filled the air. The scent of the dual candle set ($32 retail) is strong but not overbearing. The hand wash $14 retail) and lotion ($14 retail) would be perfect to display in your guest bathroom during the holidays. 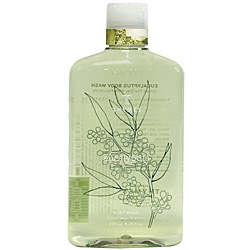 If you are looking for something refreshing and invigorating, try the Eucalyptus collection with the fragrance of eucalyptus, Italian lemon, lime and petitgrain, including soothing aloe, moisturizing jojoba oil and honey. The body wash ($20 retail) will be sure to get you going and energized. My ultimate favorite Thymes scent is Red Chérie, a mixture of red fruits and flowers, pomegranate, ripe red cherries, passion flower and jasmine, with a twist of lychee and fruity musk. The body lotion ($25 retail) is perfect for me. I love the sweet, fruity aroma. It's hard to find a lotion that is not overbearing or too sweet smelling. What I love about all these collections is that it would be so easy to put a gift set together as a gift - body wash/body scrub, bath powder/body lotion and candle/home fragrance mist. Skin care and makeup can be so specific to one's preference and needs, yet bath & body and home fragrance products are items everyone can use.